UPDATE: Justin Hoyt is no longer employed by Treasure Valley Plumbing. Justin Hoyt joined our team the first of October 2016 as a third-year apprentice, and we are so glad he did. 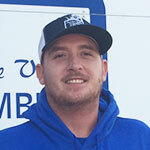 Justin has good experience as a Service Plumber and as a Construction Plumber, two important areas in our business. Justin and his family moved to the area this year. He’s a pretty easy going guy and should fit in with our team beautifully. We are glad to have Justin as part of our team here at Treasure Valley Plumbing & Drain Service, Inc.